Recessed Base MBS 46,000 lb. The D-Ring with recessed base provides an opportunity to have a lashing point that lays flush to the deck when not in use. It is available with sides or without as shown below. Please note that the strength ratings expressed are "ultimate" loads or "Breaking Loads" and not "working loads." The strength is based on a single vertical pull, although most applications will result in the load direction to be at an angle or a compound angle. Please consider the angle(s) of pull you will encounter with your application as it increases the strain on the tie down at any given weight load. See the D-Ring and Strap page or download the PDF for D-Ring Dimensions and strength data. 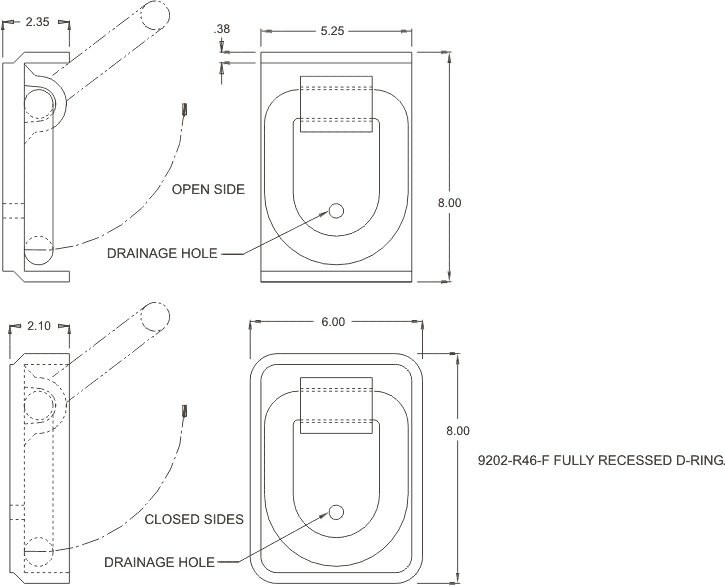 9202-R46-F (Fully Recessed D-Ring): 15 lb. Note that loads are expressed as breaking loads and not working load limit, which is to be determined by the user.